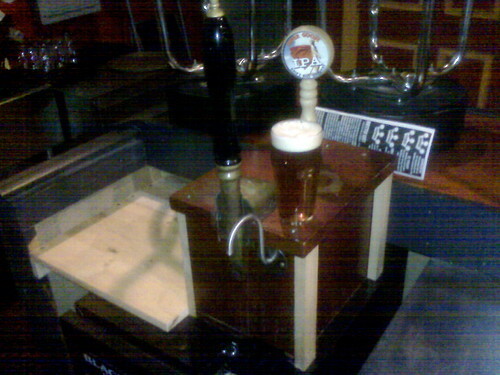 After months and months of tracking down parts, we finally unveiled our beer engine a week ago. I heard about a beer engine months ago from John O’Gara, manager at the Parkway Tavern, and past employee of The Swiss. He told me Jack at The Swiss took out their engine recently, and I should inquire. Jack was glad to see it go to a new home (lemme pause for a moment to admire how people in this business help each other out, answer questions, and generally look out for each other…amazing). I even left the wooden tower it came in, wear marks and all, with just a few minor repairs to the corners. My own piece of Tacoma beer history. I had it rebuilt and ready to go, mounted it to a small cooler that could hold steady cask temperature, and blammo…cask handle is born!